Trash and recycling collection are provided by Blue Diamond Disposal in accordance with the 5-year contract Chester Twp. has with Blue Diamond. Starting in 2013, the cost of trash stickers will go up to costing $16/sheet ($1.60/sticker) for trash collection. Stickers will continue to be sold at the Municipal Building during normal business hours 9:00 AM to 4:30 PM, Chester Camera (located in the Shop Rite Mall), and Chester Antique Mall (located on Route 24). For purchase by mail, the address is P.O. Box 267, Succasunna, NJ 07876. Payment is with cash or check only. Purchase only a 32-gallon trashcan, which is the standard industry size. Do not use anything larger than this. Have all trash and/or recycling out by 6:00 am the morning of pickup. Anything placed out later may NOT get picked up. Do NOT place trash stickers on trash can lids or handles. Any questions, call Blue Diamond at 973-598-9800.? Schedule: Stickered trash and bulky items will be collected every Wednesday. Recycling collection occurs every Friday. If a collection day fall on a holiday, the material will be collected the next non-holiday weekday. Metal Appliances	(Disposal) Appliances may be set out for collection as long as they do not contain refrigerants (such as refrigerators, air conditions and dehumidifiers). If you have appliances with refrigerants (freon) contact the municipal building for collection information. Type 10 Municipal Solid Waste	(Disposal) Starting in 2013, trash stickers cost $1.60 each and are available in sheets of 10 stickers for $16. These stickes will be valid until 12/31/12. Type 13 Bulky Solid Waste	(Disposal) Household bulky items such as furniture, bedding, carpeting, etc. can be placed at curbside and will be collected without stickers. Type 13C Construction & Demo. Debris	(Disposal) Must be contained and bundled and must have one sticker for each 30 pounds. Lumber, doors, windows, etc. are considered construction or demolition material and must be stickered accordingly. No auto parts, tires, hazardous materials will be accepted. New for 2013 is single-stream recycling - What can be recycled? Paperboard boxes such as cereal, pasta, tissue, milk & juice cartons, juice boxes, frozen food boxes; corrugated cardboard (flattened) & paper bags; shredded paper; plastic food & beverage containers, plastic cups, plastic jugs; any plastic item containing the recycling symbol #1, #2, & #5 ; glass bottles & jars; metal cans & clean aluminum foil, pie plates & trays; loose metal jar lids & steel bottle caps; cardboard beverage carriers; file folders & office paper; junk mail, catalogs & magazines, phone books, paper towel rolls & paperback books. Place all these items into ONE container. DO NOT place anything in plastic bags. Collection size container cannot be larger than 32 gallons and use more than one container if necessary. Please flatten all cardboard boxes; empty and rinse all containers; collection size is limited to 32 gallons and use more than one container if necessary. Pizza boxes are acceptable provided they are clean and free from grease; the wax paper from the pizza box is not recyclable and should be thrown in the garbage. Bottle caps may be recycled provided they are placed back on the container; do not recycle loose bottle caps. Hard covered books may be recycled provided the cover is removed. Items not acceptable are no scrap metal; no VHS/VCR tapes; no plastic bags; no needles or syringes; no window panes, mirrors, ceramics & Pyrex dishware; no stickers or address label sheets; no electronic waste; no paint, pesticides, oil & cleaners; no motor oil or antifreeze containers; no organic material and food waste; no waxed paper or waxed cardboard; no Styrofoam or paper to-go containers. Please contact Blue Diamond Disposal at 973-598-9800 or Chester Township Municipal Building 908-879-5100 x812 or by email medwards@chestertownship.org with any questions. Schedule: Recycling collection occurs every Friday. If a collection day fall on a holiday, the material will be collected the next non-holiday weekday. Aluminum Containers	(Recycling) No aluminum foil, pie tins or aluminum scrap Can be mixed in one reusable container with plastic, glass and steel containers. Do not store in plastic bags. Brown Paper Bags	(Recycling) Flatten, cross-tie and bundle can be mixed with corrugated cardborad. Chipboard/Paperboard	(Recycling) Remove linings from cereal boxes. Place at curbside in reusable container. Protect from wind and rain. No paper towels, tissues or food-contaminated paper. Corrugated Cardboard	(Recycling) Flatten, cross-tie and bundle can be mixed with brown grocery bags. Glass Containers	(Recycling) No window panes, broken glass, glassware or ceramics. Can be mixed in one reusable container with plastic, steel and aluminum containers. Do not store in plastic bags. Mixed Office Paper	(Recycling) Place at curbside in reusable container. Protect from wind and rain. Remove linings from cereal boxes. No paper towels, tissues or food-contaminated paper. Newspaper	(Recycling) Must be cross-tied in bundles no heavier than 25 pounds or place in brown-paper bags. Do not place in plastic bags. Other Paper/Mag./JunkMail	(Recycling) Place at curbside in reusable container. Protect from wind and rain. No paper towels, tissues or food-contaminated paper. Plastic #1 (PETE) Bottles	(Recycling) Look on bottom of container for #1 recycling symbol. Bottles only, do not include platic tubs such as butter, yogurt, cottage cheese, etc. Can be mixed in one reusable container with glass, steel and aluminum containers. Do not store in plastic bags. Plastic #2 (HDPE) Bottles	(Recycling) Look on bottom of container for #2 recycling symbol. Bottles only, do not include platic tubs such as butter, yogurt, cottage cheese, etc. Can be mixed in one reusable container with glass, steel and aluminum containers. Do not store in plastic bags. Plastic #5 (PP) Food/Bev. Containers	(Recycling) Look on bottom of container for #5 recycling symbol. Bottles only, do not include platic tubs such as butter, yogurt, cottage cheese, etc. Can be mixed in one reusable container with glass, steel and aluminum containers. Do not store in plastic bags. Steel (Tin) Containers	(Recycling) Can be mixed in one reusable container with plastic, glass and aluminum containers. Do not store in plastic bags. Seasonal collection of Christmas trees. Schedule: Typically Christmas trees are accepted curbside a few days during January; confirm dates with township. For 2012 trees are accepted from 1/17/2012 to 1/20/2012. Residents who have tree debris as a result of Hurricane Sandy (2012) are permitted to place tree limbs/branches (no larger than 4" in diameter) curbside and the Dept. of Public Works will be picking up. December 15,2012 is the cut off date for placing debris curbside or dropping off at DPW. There is no set schedule on when they will be in your neighborhood. Residents or landscapers working for residents of Chester Township may drop off at the DPW Garage located at 65 Furnace Road Monday thru Friday, 7:00 am until 3:30 pm and must check in at the Public Works Office prior to dropping off showing proof of residency. The DPW Garage will be open every Saturday up to December 8, 2012 to drop off debris until 3:00 pm. No limbs larger than 4" in diameter will be accepted. NO STUMPS WILL BE ACCEPTED. Hours: Beginning in 2016, the drop-off is on the first Wednesday of each month.between the hours of 8 a.m. and 2 p.m. and the first Saturday of each month between the hours of 8 a.m. and 12 noon. Limitations: All residents of Chester Township and Chester Borough may participate in the program. Proof of residency is required. A drop-off receptacle for the disposal of home electronics is now available at the DPW Yard. Accepted electronics include only the following: computers, laptops, televisions, monitors, desktop printers and fax machines. All other electronic waste should be disposed of in the garbage as it is not covered by the E-waste law and program.Accepted electronics include only the following: computers, laptops, televisions, monitors, desktop printers and fax machines. All other electronic waste should be disposed of in the garbage as it is not covered by the E-waste law and program. Absolutely no curbside collection. There will be someone at the garage that can assist you when bringing in your ewaste. 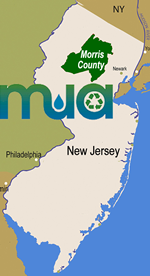 Tires	(Recycling) Car tires - Call 908-879-5100 x812 to verify costs, availability and restrictions. Click below to view original documents regarding Chester Township. If inconsistencies are discovered between these documents and the information provided below, one should initially assume Chester Township document is correct as it was produced directly by the town. Please contact Chester Township to verify any issues you are uncertain about and please forward any corrections to the MCMUA at info@mcmua.com.